Discussion We are Recruiting SecuReporter Beta Testers! We are Recruiting SecuReporter Beta Testers! Zyxel has produced over 200,000 ZyWALL products around the world. To further improve ZyWALL products, we develop the new Security analytics license “SecuReporter”. We hope to receive feedbacks from your side before our official launch. Did you know most of the security products available now can only warn of an attack that may have already been in process or even finished? Security analytics can help you analyze threats to determine its nature, the extent of incident, and take proper actions within your firewalls in a more efficient way! Now is your chance to be our very first beta tester of SecuReporter, you will not only get early access to SecuReporter before release, but you’ll get a one-year SecuReporter license for free. If you have ever purchased any product of our ZyWALL USG Series and you’re interested in trying our new security analytics service, please fill-in the Beta tester application form. We will invite the selected testers to join our product pre-launch discussion in our Zyxel business forum, so you can share your experience of using the SecuReporter service with us along with other beta testers. Where to find Documents and Guide how to register and how to use SecuReporter (User-GUIDE)??? Only just saw this, and REALLY want to be able to participate ! Well, CoreSG, you're in luck! If you have a compatible device, Zyxel just forced a SecuReporter trial subscription on everybody, whether they want it or not. I don't want it, but there appears to be no way to opt out of this cloud crap. I especially don't like someone making changes to my routers without permission. Frankly it smells a whole lot like a CFAA violation. Yesterday I received an e-mail that I activated a new service at myZyxel. It's about SecuReporter_Trail. But I never asked or activated that service. First I thought that somebody in my name activated that service, but reading Don_W comment, I see that Zyxel activated that service. Maybe in the future: Zyxel please inform your users in an e-mail that you are the responsible one that activated that service. Very confusing. 1. We will reset the trial license by 19th October 2018. 2. You can check SecuReporter Trial service will be reset on www.myzyxel.com after Oct. 19th. 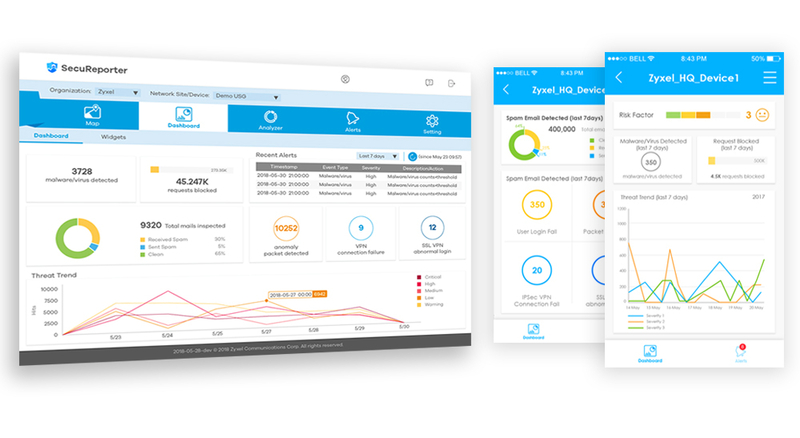 If you need SecuReporter, you can activate Trial 30 days by yourself with your myZyxel.com account. Any idea where the Cloud service is? I cannot find any info on 'how or where to start'. The app for Android in not working. I missed the beta application window but got one month trial licenses on my USGs and have been playing with it on a dozen or so of our USGs. Lots of potential but also lots of issues with web interface (seems like everything redirects to 'Device Details') Where can we submit feedback? I don't have permission for the beta forum linked to in the web portal. We have officially launch SecuReporter and you are welcome to submit your feedback through below Cloud CNM series board.